How Can Filing for Bankruptcy With Wood & Brewer Be Beneficial in Delaware, Ohio? A lot of people think of filing bankruptcy as being a bad thing. However, it can be a really good way of getting your finances under control. If you live in Delaware, Ohio, you should know that Wood & Brewer can help you through the entire process of filing bankruptcy. These are a few reasons why this might be a beneficial decision for you. As you might already know, creditors can be brutal when it comes to calling, sending letters and otherwise harassing you. If you are receiving a lot of collections calls about money that you owe, you could feel stressed out all the time. Plus, receiving these phone calls can be quite embarrassing, particularly if your creditors are calling your references or your place of employment. 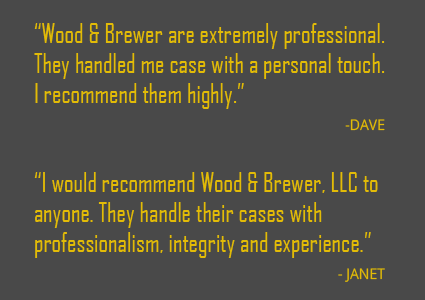 Once you file bankruptcy with the help of Wood & Brewer, your creditors will have to stop acting against you. This means that they are not even allowed to call you. Are you facing foreclosure? If so, you could be concerned about how you are going to save your home. If you can’t come up with the money to get caught up on your payments, bankruptcy can be a good option. Even though it will not fully prevent foreclosure, it can help you stall the process so that you can get your finances under control and save your house. Credit is important if you want to buy a home, get a credit card, take out a loan or even rent an apartment or get a job. Right now, if you are behind on your bills, your credit score is probably taking a heavy hit because of it. It’s true that bankruptcy can also negatively affect your credit, but the good thing about it is the fact that it can help you wipe your slate clean. Then, you can start working on rebuilding your credit, and you might find that your score is better than it has ever been in just a few short years. As you can see, even though there are some negative aspects that go along with filing bankruptcy, it can be a good idea for many people. If you contact Wood & Brewer, you can schedule an appointment for a consultation so that you can find out more about the benefits of filing bankruptcy and so that you can determine if it’s a good idea for you and your financial situation.